David Cooks Acoustic tour revue! Season 7 winner of American Idol came back to Washington D.C. On Wednesday November 14th for his acoustic tour. I saw David Cook perform earlier this year and was looking forward to this show and he did not disappoint. 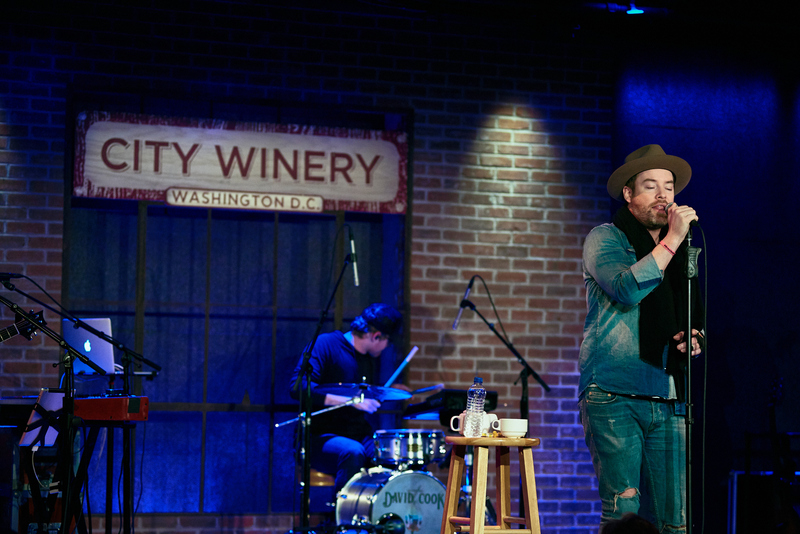 David Cook took the stage with his band at the City Winery D.C. This is David’s first acoustic tour, he and his band spent time re-working songs to play acoustically which gave his songs an updated sound they were looking forward to playing. I enjoy seeing artists at smaller venues such as the City Winery D.C. because it allows the artist more interaction with the fans, and is more personal of a show. This show was a perfect example. David mentioned he was wearing something new to this show… A scarf, which he showed off jokingly to detract fans from his real new item. a cast on his left arm. He had broken his hand and wrist, which was preventing him from playing. They talked about postponing the tour but had one of his music techs work on playing for David and he learned to play the music in two weeks. He did a fantastic job and the fact he learned it in that short of a time was impressive. I am sorry I do not remember his name! David opened up the show with the song “The Lucky Ones” from his latest EP “Chromance”. The crowd tonight was a subdued crowd. David Used his sense of humor to have a little bit of fun with the audience and liven up the crowd. David’s interaction with the audience was great. Before playing the song “Kiss & Tell” he asked the audience if there were couples in the room. He said the next song maybe was for them as well as single people as well. The banter between David and the audience was great and had them laughing. David is not only a great musician, but he is also a great story teller. He spoke of how much he loves watching Netflix, asking the audience what they liked to watch and the show Keepers came up. He asked who in the audience had seen the show. To David’s surprise, he heard a woman say she was in it. He asked if she was serious and she said she was. Baltimore native Jean Hargadon Wehner, aka “Jane Doe” was in the audience. David was star stuck and was excited to have a real star in the audience! Introducing the song “Goodbye to the Girl” David talked about the passing of his brother Adam from brain cancer. Writing music helped him cope with the loss and he had written a lot of songs for his new album and had a lot of songs in the “can” he did not like. He joined two of his friends, Andy Skibb and Neal Tiemann in the studio and the story of writing the song and how it saved him. David also performed covers of David Bowie’s “Heroes” and Noah Gundersen’s “Day is Gone”. He ended the show with this song “Come Back to Me”. David came back for an encore, and someone yelled out “Free Bird”. David told a story of someone giving him money when he first starting playing music to never play the song. In the meet and greet he has a fan give him a Christmas ornament that played the song “Free Bird”. He had this on the stage and unofficially started his encore with the chorus of “Free Bird” from this ornament. For the first song of his encore, they played “Light On” and to end the show, he played his new single which has just been released. The song is “Death of Me” and I sat there listening to the song and my first reaction was this song should be a hit. The guitar and percussion were catchy and simple, but Davids vocals shined and to me is what made the song great. I left the show and first thing I did when I got to my car and listened to the song a few times on my way home! If you have not heard his new single yet, take a listen, I think if you’re a fan of David’s music, you will be a fan of this song as well! In closing, David Cook is such a great performer, from the music to his vocals, he is one of the few artists who I would love to see anytime they came to town. I hope he comes back again soon. I am a big fan!